COMING UP: An EXCLUSIVE interview with the President of Afghanistan, Hamid Karzai. 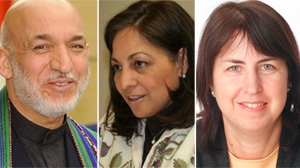 This Sunday, Christiane Amanpour talks to Afghanistan's President, Hamid Karzai in a This Week exclusive. As he threatens to kick out private security, can he turn the war around before U.S. forces start pulling out? With the July, 2011 drawdown for U.S. troops now in limbo, she'll ask him tough questions about the way forward for Afghanistan. Just how strong is the Taliban? Can corruption be rooted out? Will the Afghan Army be able to secure the country without the help of the U.S. military? Then, a lead organizer of the controversial Islamic center near Ground Zero, Daisy Khan, wife of Imam Feisal Abdul-Rauf, comes to This Week in an exclusive interview to explain how she thinks the project should go forward. Is there room for compromise? Will developers consider moving? She will be joined by Rabbi Joy Levitt, head of the Jewish Community Center in Manhattan, considered a model for the Islamic center. Plus our roundtable with George Will, former Clinton Labor Secretary Robert Reich, Judy Woodruff of the PBS News Hour and Bloomberg's Al Hunt. They'll look at the Iraq withdrawal and the Afghanistan surge. And, why is the "summer of recovery" looking so dismal on the jobs front? The roundtable also takes up the politics of the Islamic Center controversy.